GRENDEL project follows developments of future innovative technologies and alternative fuelling options for inland waterway vessels with the goal to share this know-how with the Danube inland vessels operators and stakeholders. On 5 November 2018 the feasibility study "Perspectives for the use of hydrogen as fuel in inland navigation" was handed over at the Association for European Inland Navigation and Waterways in Duisburg, Germany. The study was developed as part of the German-Dutch cooperation project MariGreen under the auspices of the RWTH Aachen University for clients MARIKO GmbH and FME. The development trends and perspectives of hydrogen use in inland navigation were elaborated. While the use of hydrogen is not yet economically viable for ship operators due to several factors, as the costs of regenerative hydrogen production as well as ship conversion are significant, the study underlines the fundamental technical feasibility in many areas of inland navigation. This assessment is based on the analysis of existing and future hydrogen infrastructure, various storage technologies and energy conversion in fuel cells and combustion engines. As an example, the assessment is presented for four types of inland waterway vessels (cargo ship, pusher unit, Rhine ferry and a cabin / passenger ship). Another component of the study is the special requirements for training and training measures in dealing with various hydrogen technologies. In addition, the legal situation for the use of hydrogen as fuel was analysed and recommendations for actions were formulated. 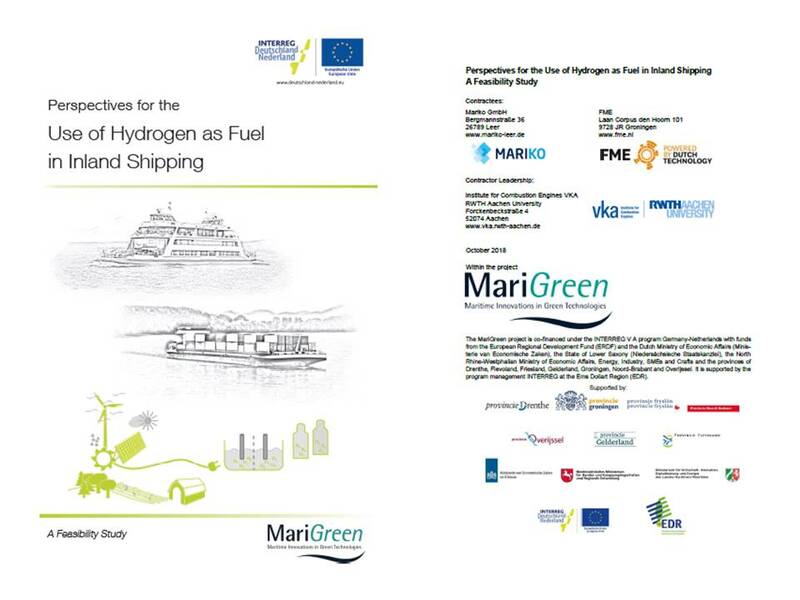 In order to overcome barriers to entry on the way to using hydrogen as fuel in inland navigation, the study strongly recommends the initiation, development and promotion of demonstration projects demonstrating technical feasibility. The study is available for download. The MariGreen project is funded under the INTERREG V A program Germany-Nederland with funds from the European Regional Development Fund (ERDF) and national co-financing from Germany and the Netherlands.